Polaroid photography, which looked about to fade out forever for a while there, has in recent years made a comeback. Chalk it up, if you must, to a grand revaluing wave of the physically analog in our age of digital ephemerality — the same tide on which enthusiasm for vinyl, zines, and even VHS tapes has risen again. But we must acknowledge that Andy Warhol, in a sense, got there first. It hardly counts as the only matter on which the mastermind of the Factory showed prescience; take, for instance, his quip about everyone in the future getting fifteen minutes of fame, a prediction which, as Jonathan Lethem put it, has in our present hardened into "drab processional." Some of these very 21st-century people now enjoying (or enduring) their own fifteen minutes — most of them presumably not even born within Warhol's lifetime — surely keep a Polaroid camera at hand. They acknowledge, on some level, what the consummate 20th-century "pop artist" sensed: that the ostensibly cheap and disposable, including self-developing film used for untrained vacation snapshots and mere reference material for "real" works of art, has its own kind of permanence. Here we have a selection of Warhol's own works of Polaroid photography, a medium he took up around 1970 and used to further his interest in portraiture. The University of California, Berkeley Art Museum, just one of the institutions to put them on display, says that "these images often served as the basis for his commissioned portraits, silk-screen paintings, drawings, and prints." The wide subset they showed "reveals that superstars were not the only figures that Warhol photographed with his Polaroid Big Shot, the distinct plastic camera he used for the majority of his sittings. Over half of those who sat for him were little known or remain unidentified." Whether of Mick Jagger, Yoko Ono, O.J. 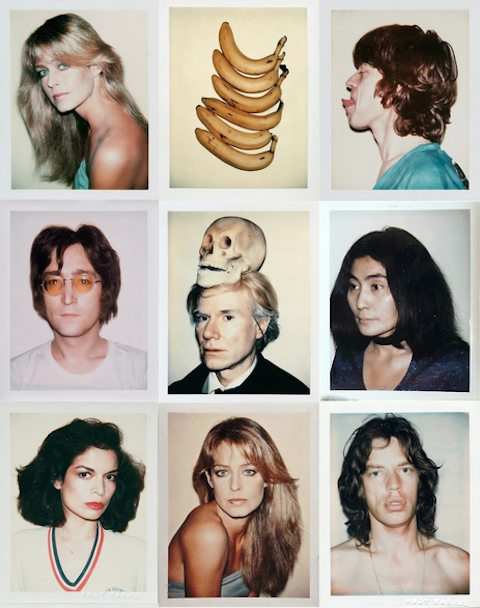 Simpson, Debbie Harry, himself, a row of bananas, or someone faintly recognizable yet ultimately unnamable, each of Warhol's Polaroids remains "fully identified with the artwork that ultimately grew out of it; the face depicted becomes a kind of signifier for larger cultural concepts of beauty, power, and worth." You can see at least 85 of Warhol's polaroid portraits at a site called These Americans. Now what would Warhol, a known early enthusiast of computer art, have said about the arrival of Instagram filters meant to make our instantaneous, high-resolution digital photos look like Polaroids again? my friend Shady Lane used to be part of the crowd that hung out there..